For hay fever sufferers, the lush grass that surrounds them can look anything but inviting. Instead, these allergenic grasses can seem like a warm weather enemy as they trigger painful hay fever symptoms from what should be enjoyable, sunny days outside. For many hay fever sufferers, they have tried numerous over-the-counter or prescription treatments that have not been successful and they are constantly waiting for new, more effective treatments to emerge. One potential 'treatment' that has shown promise is hypoallergenic grass. A new type of grass seed has been genetically modified to omit two of the common hay fever allergens. The aim is twofold: to improve the public's perception regarding genetically modified products and to dramatically improve hay fever symptoms for sufferers. In the United States, a common trigger of hay fever symptoms is ragweed. In Europe, however, ryegrass is a key culprit. 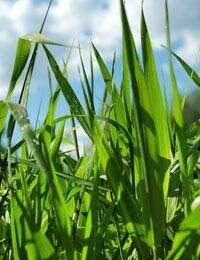 The hypoallergenic grasses are genetically modified perennial and Italian ryegrasses. Ryegrass is very allergenic, mostly due to the pollen proteins and broad distribution. People susceptible to allergies from ryegrass also tend to be allergic to other forms of grass as well. With genetic modification, scientists have not exactly turned off the expression of the genes fully, which means there is still some level of allergens. At present, they have managed to successfully reduce pollen proteins by fifty percent. There is, however, the chance to completely remove the offending allergen, which means turning off the offending genes. Unfortunately, it will still be many years before these hypoallergenic grasses are available to the market. Field trials are still ongoing and there are various issues to resolve before hypoallergenic grass becomes a practical reality for hay fever sufferers. Still, there is hope that even a fifty percent reduction can make a major difference in symptoms. In particular, a complete removal of the allergenic genes would be exciting news for hay fever sufferers - more so if the grass is widely used to allow for less hay fever discomfort. Despite the scientific challenges themselves in terms of ensuring that the grass does not harm biodiversity or cause unexpected problems in humans, there is also the controversy of genetic modification to consider. Many people do not support genetically modified foods and products but the true question is whether they will support a hypoallergenic grass that can reduce hay fever suffering for millions of people. It is expected that some people will remain steadfast in their stance regarding genetic modification, even in this instance. Thus far, however, there appears to be a great deal of public support for this kind of genetic modification although there are still some members of the public who are against any form of this technology. One of the hopes from the research on hypoallergenic grass is that for those members of the public who are currently against the concept of genetic modification, this new hypoallergenic grass will broaden their views and will demonstrate the importance and use of the technology in medicine for reducing suffering of an allergy that afflicts many people around the world.